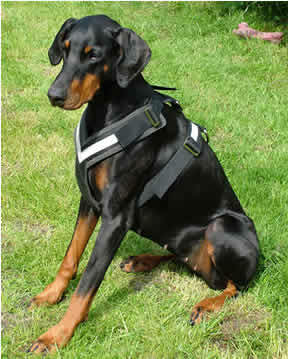 Our model dobermann, Roxy, weighed slightly less than 30kg but needed the large harness. 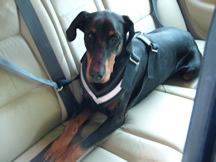 Picture shows Roxy on the back seat of the car, with the harness attached to the seatbelt via a secure clip. For the purposes of the photograph she is lying on the car's pale leather upholstery, but needless to say when she's muddy after a walk there's a cover to protect the seat! The car harness is useful if you haven't got space in your boot for a crate or if, like us, you have too many dogs to fit in the crate!